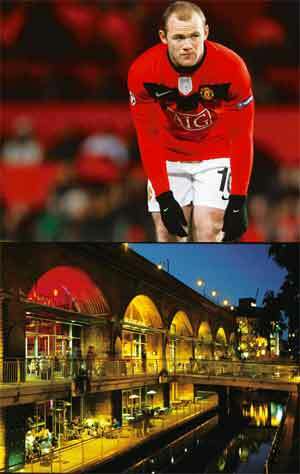 Seeing Red: (top) Old Trafford and Wayne Rooney; the pubs at Deansgate Locks. Like many English cities, Manchester has Roman origins. But it was a late bloomer, coming into its own only during the late 18th century, as textile manufacturers homed in on its hilly landscape, abundant water supply and the proximity of the port of Liverpool to set up cotton mills. History books go so far as to call it the world’s first industrialized city. Interestingly, it was also the hotbed of Left-wing politics; Engels is known to have met Marx frequently at Chetham’s Library. In the latter half of the 19th century, Manchester was also an important theatre of action for the suffragettes, for new artistic ideas, for education and trade. In this, the city’s golden age, fabulous new buildings came up; many of them still survive. Later, Manchester diversified into industries such as chemicals and engineering—it made aircraft for Britain’s Royal Air Force—so much so that during World War II, the city was methodically blitz’d. We could simply replace the word with “football". Home to two giant football teams—Manchester United and Manchester City—the city sees some of the most exciting sporting action of the English Premier League. For Man U fans, a tour of the Theatre of Dreams is a must: Tickets for the museum and stadium cost £12.50 (around Rs975) and are available for all days, except match days. Click here for details. If it’s City, the world’s richest football club, that you are a fan of, tours are available for £7.50. An hour away from Manchester is the National Football Museum. And oh, there’s also a cricket ground, also called Old Trafford, which is the home of the Lancashire Cricket Club. Click here for details. For a different kind of spectator sport, try greyhound racing: At the Belle Vue Greyhound Stadium, races are held three evenings a week round the year. Admission prices are from £3. And if you’d rather play a sport, there are plenty of options for that as well. The Manchester Sport and Leisure Trust runs 19 public indoor sport facilities in the city, outfitting everything from swimming to martial arts. Some of the hangover of the days when Manchester was the place for intellectual ferment persists today in its diverse museums. Through March, the Imperial War Museum will showcase Living with the Wall: Berlin 1961-1989, a must-see for anyone interested in modern history. Till January, there’s Captured: The Extraordinary Lives of Prisoners of War, featuring soldiers of World War II. There’s also the Manchester Jewish Museum, the Museum of Science and Industry and the Museum of Transport. You could also access the free-to-download Radical Manchester self-guided tour from visitmanchester for a comprehensive trail through the city’s past. If you go for more contemporary stuff, try The Sound of Manchester (music), Creativity and the City (fine arts) and A City Performs (theatre) guides from the same site. Alternatively, drop in at Cornerhouse for three floors of contemporary art, or Urbis to see an exhibition about city life. Manchester has a long musical history, having produced bands from the BeeGees in the 1960s to Joy Division, Stone Roses, Simply Red, Oasis, Take That (who had a song called Mancunian Way) and Verve through the 1980s and 1990s. Many venues continue to thrive, including the Twisted Wheel, once a must-stop for American soul artists of the 1960s, and The Hacienda, the heart of the late 1980s-early 1990s “Madchester" music scene. Possibly the best way to experience the current music scene is to hit the city’s bars and pubs. Among the must-visits: The Roadhouse, MoHo Live and Night & Day Café, all of which play live music. Mancunians (as Manchester residents are known) divvy up the city into six party locations: the Northern Quarter (among the pubs and bars to try: Walrus, Trof, Odd, Socio Rehab); Canal Street/Gay Village (Velvet, Taurus, The New Union, Vanilla); Deansgate Locks/Castlefield (Baa Bar, Fat Cat Café Bar, Barca); Deansgate (Cloud 23, Living Room, Slug and Lettuce, Label, Prohibition); the Printworks (Pure, Norwegian Blue); and Oxford Road (Thirsty Scholar, Revolution, Joshua Brooks, Jilly’s). For British food and takes on it, go to The Market Restaurant, Mr Thomas’ Chop House, Northern Quarter, Opus One and Sam’s Chop House. Besides, the city offers a wide gamut of cuisines, from Chinese (Yang Sing) and Indian (Shimla Pinks) to fabulous grills (Fat Loaf, Grill on the Alley). • Get on to the Wheel of Manchester for a bird’s-eye view of the city. • Visit Heaton Park or Platt Fields for a breath of fresh air and much more. • Go to The Comedy Store or The Frog and Bucket for typically Mancunian humour. • Drop in at the Manchester Evening News Arena to listen to every genre of music, from pop to heavy metal. November events include Beyoncé, Arctic Monkeys, Taylor Swift and London comic Michael McIntyre.